Omega’s PR-24 Series RTD probes feature industry standard micro-DIN connectors for ease of installation and fast replacement. The IP65 rated connector with an all stainless steel sheath and integral thread construction is ideally suited for use in demanding industrial environments. 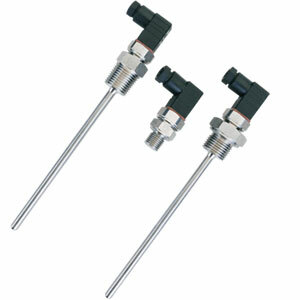 Standard process threads are G1/4", G1/2", 1/4" NPT and 1/2" NPT other threads are available on request. Note: Note: To order non-standard lengths change “6” or “150” in part number to length required in inches or millimeters respectively. Shorter lengths, no additional charge. For longer lengths add $1 per inch or 25mm to the price. PR-24 probes are supplied complete with micro-DIN mating connector with screw terminals for wire connection up to 0.34 mm^2.